Everyone has their own must haves when they travel. For me good shoes are at the top of the list. That said, I’m not a fan of having things I only use when I travel and having things I only use when I am home. I like products I can use all the time. That includes shoes, which can get tricky. Shoes are big, so wherever I am headed, my limit is three pairs. Two is even better, but three is the maximum. There’s typically my running shoes, a pair of nice walking flats that can dress up or down, and a pair of flip flops. The flip flops are important, especially when you are headed somewhere beachy. But practicality dictates they need to be wearable more places than just the beach, and the cheap, plastic ones typically don’t cut it when I leave the sand. 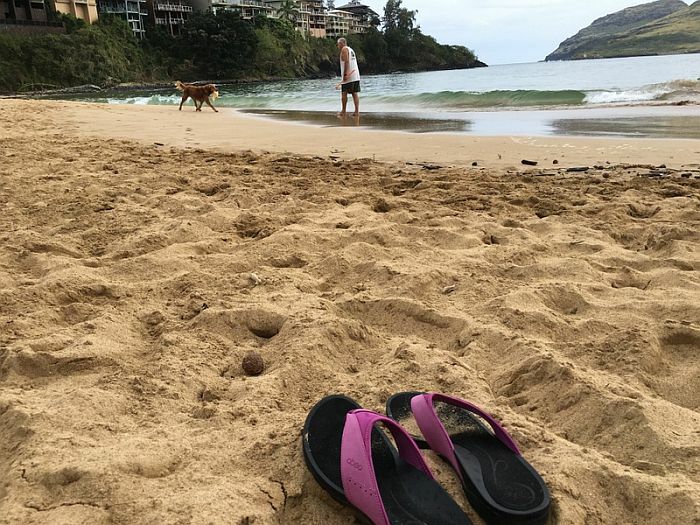 I gave a pair of ABEO’s Balboa sandals a test run on a recent trip to Kauai. The sandals have a built in orthotic system which is supposed to do things like reduce shock on your knees and help with balance. Bottom line, they’re designed to be comfortable. Overall, I was glad I made room for them in my carry-on for my trip to Hawaii. After trips to the beach, they rinsed off easily and dried quickly. They were nice enough to throw on with a sundress in the evening, and they were comfortable. I didn’t hesitate to throw them on when I knew I would be walking for stretches. If you’re thinking about investing in a high quality sandal, there are a couple things you need to know about ABEO’s Balboa sandals. Getting the perfect fit involves having a digital foot analysis. On the website, you punch your zip code and it tells you where you can go for the fitting process. If folks are unable to visit a store for analysis, they are directed to work with customer service to determine their needs. I did not have the digital foot analysis, my shoes were selected based on how I answered a few questions like my shoe size and whether or not I had neutral, high or low arches. The closest store for me to get a digital foot analysis was about an hour away. Had I had the analysis or been able to try my sandals on, I would most likely have selected a smaller size. They were a bit too big, but I still found them comfortable. They are larger than flip flops. If you think you’ll be traveling with them, know they’ll take up more room in your suitcase. The soles are bigger and they don’t lie flat like most traditional flip flops. They’re more like sandals. If you tend to check your luggage, it shouldn’t be an issue. But if you carry-on, space is always tight. Everyone’s budget for sandals is different. 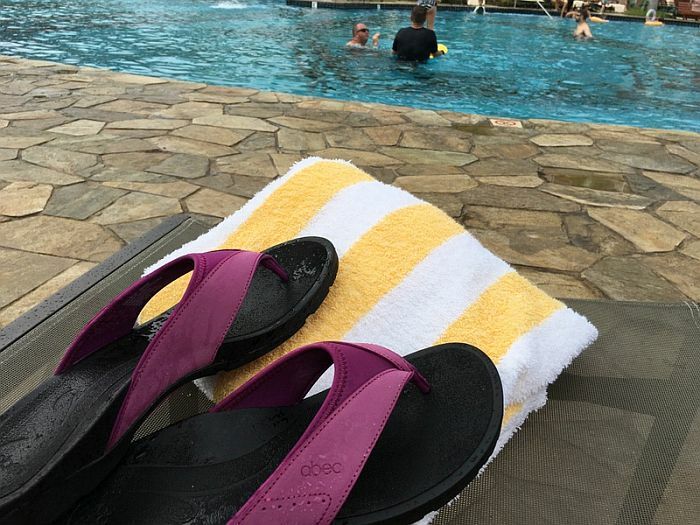 ABEO’s Balboa sandals costs $89.95. The Balboa sandals come in 27 colors. The Company offers free shipping in the U.S. via FedEx Standard, FedEx Home Delivery, or FedEx SmartPost with any order. A $10 surcharge is added to deliveries to Hawaii, Alaska and Puerto Rico. Unworn shoes can be returned up to 30 days from the date received. They must be in the original box and must be accompanied by your original sales receipt. 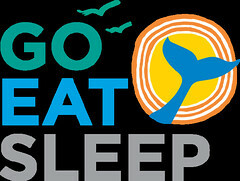 From time to time, companies send Goeatsleep their products for review. If you’re reading about it, I liked it. When I find something good, I don’t hesitate to share. As fabulous as traveling is, when it comes down to it, it’s tiring and having the right gear makes anywhere in the world a better place.